Resource Manager for Excel (RM-X) RM-X is an add-on to Excel (version 97 and greater) and is designed for single concurrent users who are familiar with Excel. A fully functional trial is available for immediate download. By combining ease-of-use for small to medium sized manufacturing operations with powerful reporting and open integration for larger operations, Resource Manager guarantees the power and productivity of high-end systems without the complications and failure rate. Also, Resource Manager -DB (RMDB), an elegant upgrade from RMX, written in Visual Basic, utilizes and includes a run-time version of Microsoft Access database and is also available with SQL Server compatibility. Resource Manager DB (RMDB) contains all the functionality of RM-X. Just like RM-X, Resource Manager DB leverages Excel for reporting. These combined offerings provide you unsurpassed flexibility for leveraging Excel on local PCs, and sharing data across a network. Finally, you can achieve your goals of an affordable planning and scheduling solution that quickly adapts to your needs. Resource Manager is the only solution that is designed to adapt to your specific needs, addressing the key issues facing your operation. Resource Manager delivers the help you need to effectively plan and schedule your company’s resources, without the time, money and upkeep of traditional options. Finally, you can quit struggling with time consuming decisions such as what to buy, what to make, when to buy it, and when to make it. Resource Manager adds powerful MRP scheduling, planning and/or tracking capabilities to your existing system (be it manual or other), for less than any other option – satisfaction guaranteed. Resource Manager runs with Microsoft Office, so you are already familiar with entering data, printing reports, graphing, and more! Resource Manager for Excel offers basic copy and paste for loading data, or form driven data entry. Where do you need to go? Which orders need to be shipped when? Resource Manager features a simple, single, screen to control your whole operation. Enter (or link with outside system), the quantities and due dates. Optionally add detailed customer or order information. Now schedule. That’s it! You are in the driver’s seat and cruise control is on. Enjoy the view. Check the production calendar for a quick view of finite – capacity loading on work centers and time-phased inventory levels. Bottlenecks are easy to spot by the red flags. Run your favorite report to view schedule data the way you like it. Need to correct a schedule? Quickly adjust working calendar, shift available resources, and click to reschedule. For effortless cruise control of your business, simply make the top level changes and regenerate the master schedule with a click of the mouse. Change delivery due dates, split up quantities, combine forward and reverse scheduling; all the options for a quick adjustment are under your immediate control. With quick, powerful, and intuitive reporting, Resource Manager-DB stands above the crowd in its ability to present the important data in an easy and meaningful way. In addition to the robust reports that are included with Resource Manager-DB, the user can easily configure canned, custom reports that become a permantent part of the system. 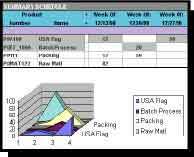 In addition, you can work with the schedule database directly and use all the power of Access and Excel to sort, graph, view, print and export, to meet your unique requirements. Resource Manager-DB excels with its integrated purchasing and receiving module. Designed to porptmeet meet the tough requirements for Lean Manufacturing, you won’t find any muda here. 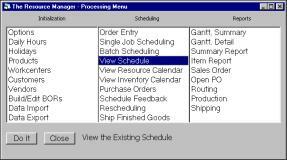 With a single click, the user can generatepurchase orders per Kanban and\or standard schedule requirements. The system tracks each received quantity, open or closed status, and adjusts inventory – simply and automatically. Automatically e-mail RFQs and POs to vendors.